Oh man, is there anything like quilting therapy so sooth the soul?? I don't think so. I did get a bit of soothing this weekend. I was hoping to be finished with this quilt but not today. 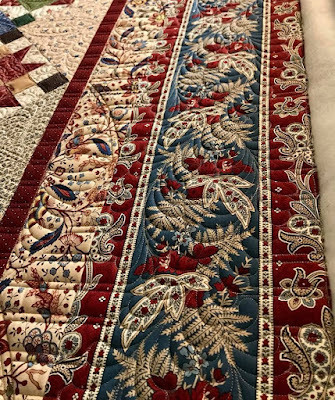 I think I had so much enthusiasm for all the newly learned things and inspiration that I severely underestimated the complexity and time to complete a feathered cable and bead board that weaves in and out of the border. Great idea, but maybe not for a time sensitive project. This baby has to be completed and returned by Mid May.....that gives me 2 Saturdays and 1 Sunday to complete, then check for stitches that need to be redone, trim, check again......and ship so that it arrives in CA by May 15. I can do this. The hardest part is over. Figuring out what to quilt (even if it's too hard) takes time and consideration. But I think I have it. So what do you think?? The pattern is Mill Girls BOM, Janice did an amazing job with this. It's got Hobbs wool batting, sooooo yummy, and glide thread on top, 40 wt, with 60 wt glide in the bobbin. Janice did a great job on this! Old Mill BOM, just beautiful. I may have been a wee bit over inspired from MQX earlier in April! 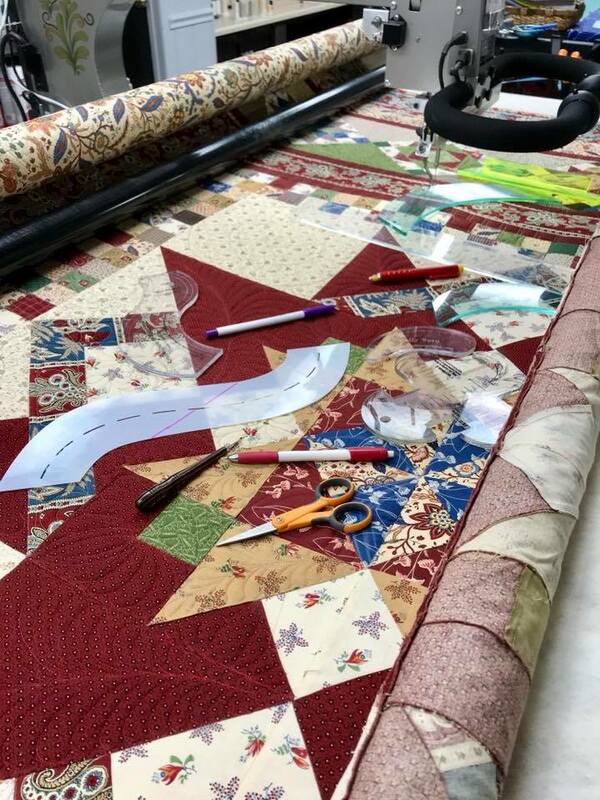 The rulers....I'm never this messy when quilting but the rulers on this quilt are just so many and for all parts. I swear I cleared off this quilt at least five time! Hope everything one has a great week. And I've got a trunk show coming up on Thursday this week in McHenry, take a look at the last blog post for details. Link parties in the sidebar, go get inspired!! Oh my! That is just gorgeous!!! You do beautiful work. Your quilting is always wonderful. Wow, what stunning work!! I am in awe of quilters like you that can come up with such fabulous quilting ideas and execute them flawlessly. I would love to hear from you, comments and questions welcome! 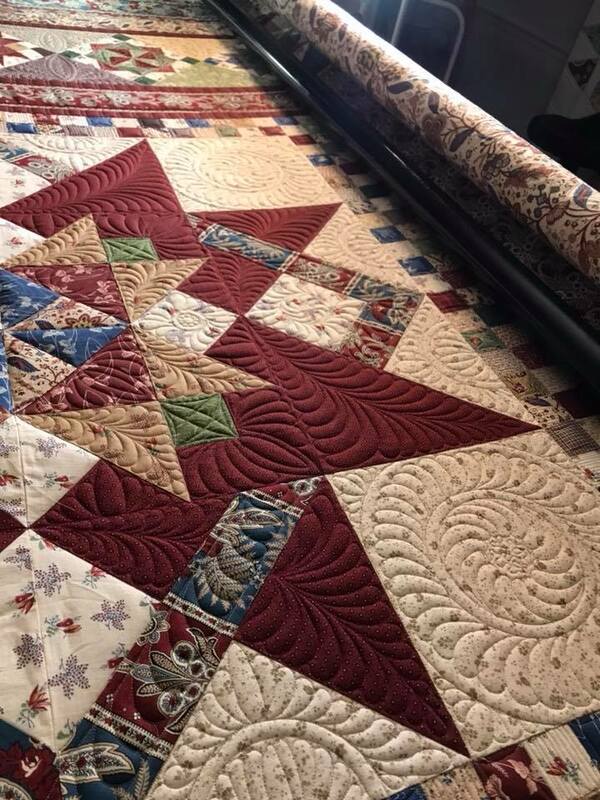 I've been long arm quilting since 2011 when I purchased a used APQS Millenium. I now have 2 computerized machines, my newest an A1 Quilting machine. 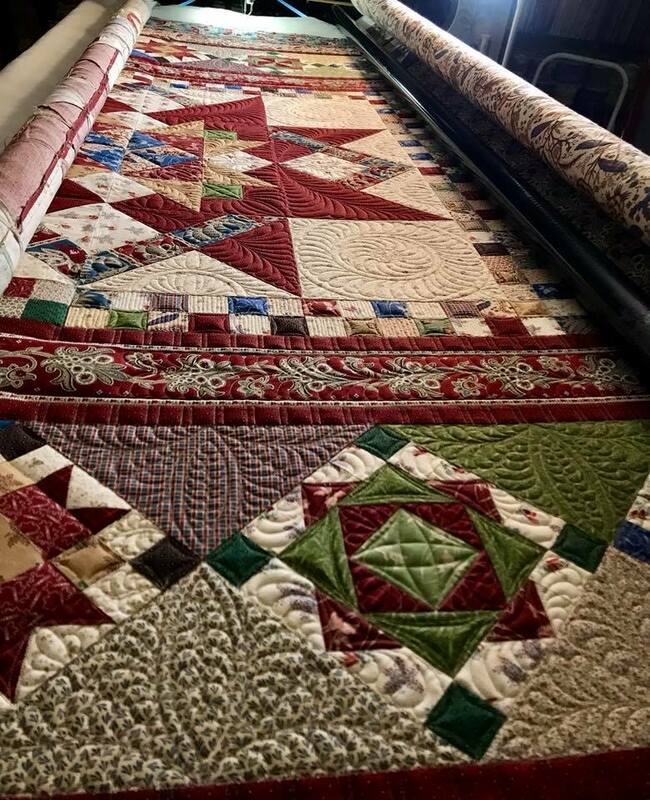 My love is custom heirloom quilting. I recently won 3rd Place at AQS Quiltweek - Fall Paducah for my Old Friends quilt which features my love of customer heirloom quilting. That was quite an honor. Starting in Nov 2018 I will be Long Arm quilting for others full time. I'm also adding private lessons from beginner to advanced and machine rental for those that would like to quilt for themselves but don't have the space or equipment to do so. I'd love to help you on your quilting journey! Trunk show - how exciting!! !